Local contestant, Rudolph Raath, from Cape Town, wins the first ever Man Vs Plane race in South Africa against a Brithish Airways A380. 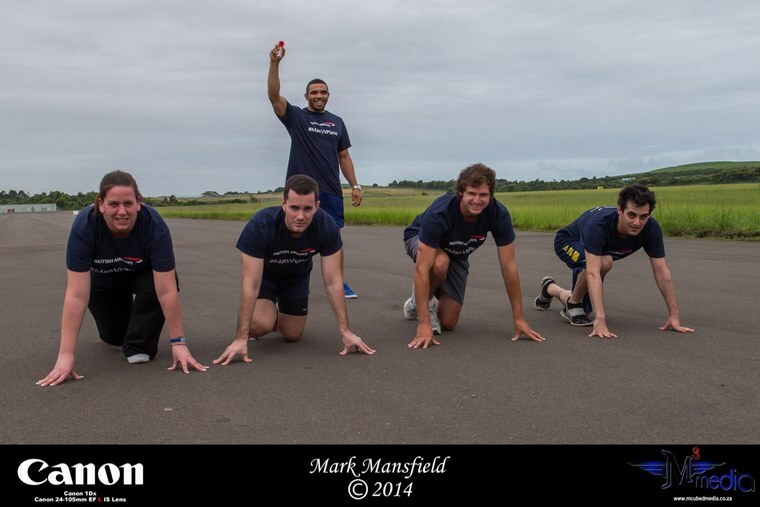 An extraordinary and South African first, race unfolded at King Shaka International Airport recently as four amateur athletes vied to emulate Bryan Habana's (South African Springbok rugby player) sprint against a British Airways' A380 and a chance to win the trip of a lifetime. Last year, Habana's incredible Man vs Plane race, grabbed international attention garnering nearly 2 million online hits and rating as one of the top 10 most watched YouTube clips in South Africa. 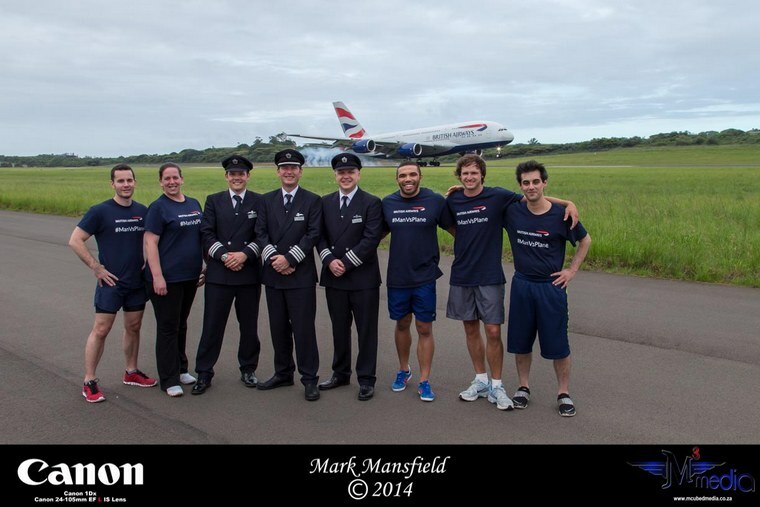 This prompted British Airways to launch an international competition to find people who would take up the challenge to pit their physical prowess against its largest and most modern aircraft. The competitors were selected from thousands of entries in online competition on Brithish Airways website. They were flown to Durban, where they where hosted over the weekend by Tourism KwaZulu Natal. 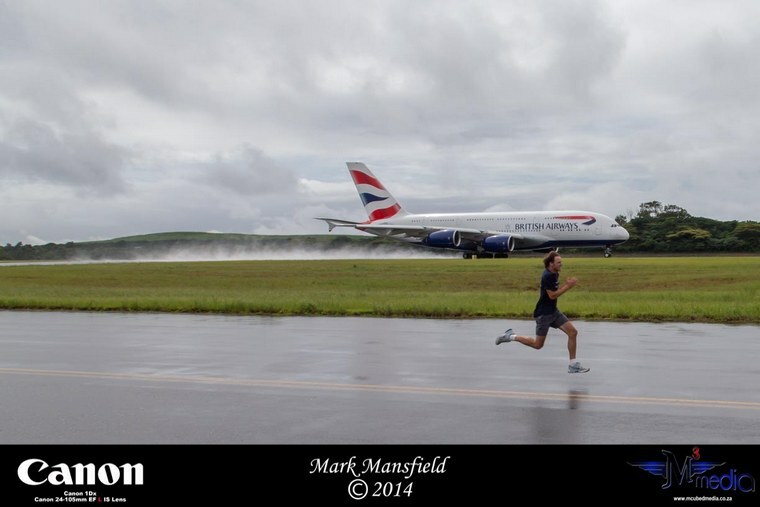 The runners from the UK, Israel, France and South Africa faced a 200m course on a taxiway parallel to the runway, pitted their strength and mental determination against the mighty A380's four Rolls Royce Trent-900 engines, each generating over 70 000 pounds of thrust. "Last year I accepted the challenge to race the A380 and won, but it wasn't easy," says Bryan Habana, "To take this on you have to be physically fit and have plenty of strength, stamina and speed." Heidi Hawkes, 30, works in the security industry and is due to get married next year, was overwhelmed to hear that she has won a place in the race. "This challenge and adventure has given me a much-needed confidence boost. I am a fun, outgoing person, excited about soaking up my South African experience." Elliot Havakuk, 35, who has dual Israeli and British citizenship, is self-employed and assists companies in the environmental sector, including some involved in developing agriculture, water access and energy supply in Africa. A keen sportsman, he's had six knee operations as a result of football injuries, but is now lean and fit. "It's actually hard to describe how I feel about winning the opportunity, as it hasn't really sunk in… and probably won't until I'm standing on the track and looking sideways at the at the +/- 500 tonnes of wing beast warming up next to me. Bigger means slower, right?" Julian Maderay, 33, is a French Air Force officer, based in Brussels. He thought the idea was crazy, but his friends convinced him to enter. He was shocked to win a place in the race and immediately began a 10-day training regime to improve his chances. 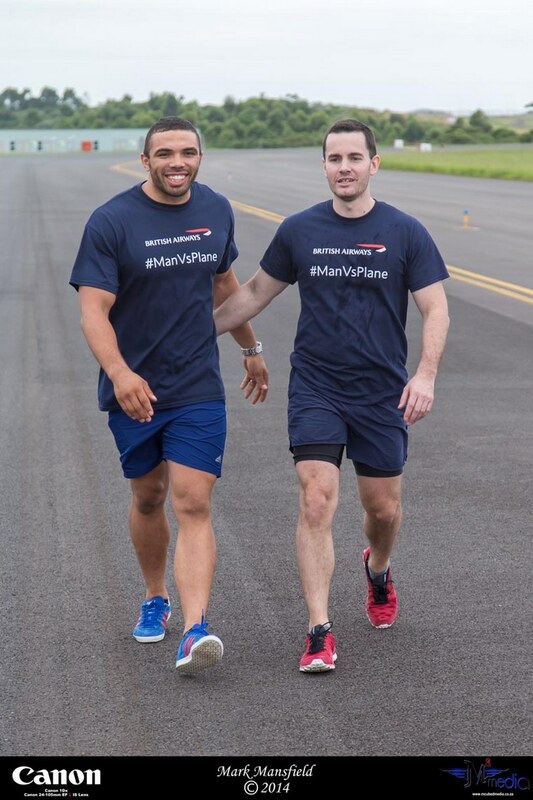 "I'm no Bryan Habana, but I accepted British Airways' challenge to test my limits on the South African runway. I will try to keep a strong body and strong mind, but it definitely will not be easy." Rudolph Raath, 23, has the closest to home ground advantage. A Capetonian who played first-team rugby, water-polo, squash and cricket for Fish Hoek High School, he now works as a project manager for a roofing contractor. Since school he has continued playing soccer and cricket and has completed six Argus Cycle Tours and is training for a seventh this year. He shares a passion for travelling with his girlfriend of five years. 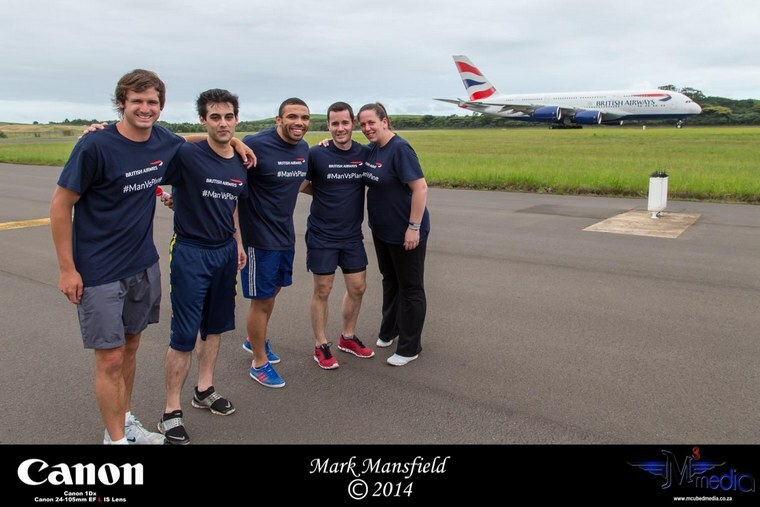 "I'm absolutely thrilled to be racing against British Airways' new A380 super-jumbo. It's so unreal - bring it on!" Prize up for grabs for the runner with the quickest time was two Club world return tickets on one of British Airways' A380 direct flights to London, Los Angeles, Hong Kong or Johannesburg.